Friendly Fire: Who owns European debt? I did a little digging to determine the amount of government debt held by banks in the different European countries. The data I used is from here. This site has a nice interactive page that lets you adjust some parameters to determine how much bailout money will be needed for the banks. 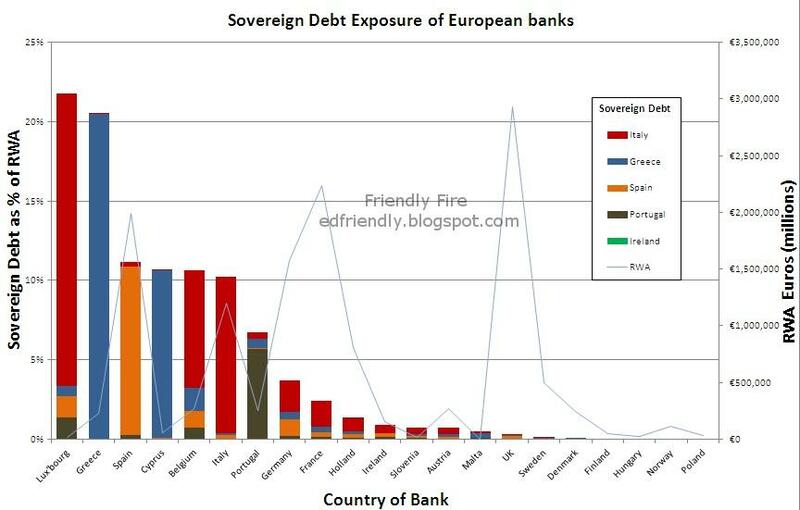 Below is a chart that summarizes the amount of sovereign debt held by the banks of different countries. What is interesting to note from the above chart is that Spanish government debt is largely held by Spanish banks, Greece government debt by Greek banks, and Irish government debt by Irish banks. Italian government debt, however, is held substantially by Germany, France, and Belgium in addition to the large holdings by Italian banks. The charts show the absolute magnitude of the debt held by the banks in the different countries. What it doesn't show is what percentage of the bank's assets the government debt represents. Government bonds were considered to be almost risk-free and therefore they were not included in RWA. RWA is used to calculate different ratios that are used to determine the bank's ability to absorb loan losses. A larger RWA means the bank must hold more reserves in order to absorb potential losses from default on loans. The chart shows the sovereign debt as a percentage of RWA along with the RWA amount (right-hand axis) for the different European banks by country. Although the sovereign debt of Luxembourg banks represent a large % of the banks' RWA, the amount of RWA in Luxembourg banks is small as seen by the grey line. Again we see Spanish and Greek debt make a large percentage of RWA in Spain and Greece, respectively. Italian government debt, however, makes a substantial percentage of RWA for banks in Luxembourg, Belguim, Italy. Italian debt makes up 2% of RWA for banks in Germany and France where banks are very large. Great charts, would be good to update them. I notice Switzerland is not in the lists, but I suspect UBS and Credit Suisse have huge exposure to southern Europe.